The GAME Rotary Sieve or Sifter is designed to remove dust or over-sized particles from customer’s products. Product is fed into the centre of a cylindrical rotating screen. 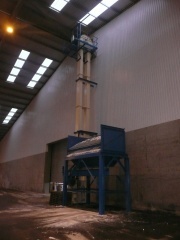 The tumbling action of the product within the screen segregates the fractions whilst moving along the length of the screen and is discharged through the end outlet. 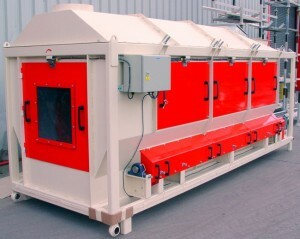 The small fractions pass through the screen and are then discharged out of an under-hopper to fines handling equipment. 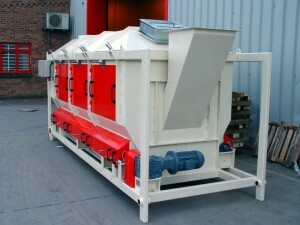 The product is fed into the machine at the feed chute end and rotated inside a mesh drum (with changeable sieve panels). The machine is angled to maintain a product flow with helper bars within the machine to carry product towards the clean end outlet. The drum runs on roller rings, being carried on drive rollers and positioning rollers to maintain stability. The case panels are removable for access to the screen panels. The rotary screen is fully sealed and aspirated and suitable to handle a wide variety of product types. Main Body & Drives: The main body is manufactured in mild steel with a painted (to Client Specification) finish with a stainless steel woven wire mesh screen. The drive and support wheels for the sifter drum are cast iron. The drive shaft is fitted with a rotation sensor, wired to the control panel. Screens: Stainless steel woven wire mesh screen (with 2mm apertures and a 1.2mm wire). The wire mesh is cleaned using adjustable static brush gear. Access Doors: All access doors into the machine body are fitted with magnetic interlock switches, wired to the control panel. Bearings: SKF units, fitted with remote greasing using a copper pipe and brass fittings terminated at suitable points around the machine. Range: the machine is adjustable between the range of 5 – 15º requiring all inlet and outlets to be fitted with purpose made connections on completion of commissioning. 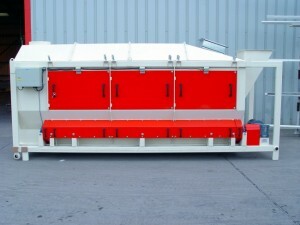 Multi-usage product – the rotary sifters can be tailored to handle specific products. Fully sealed and aspirated process. Removal of “nibs” and other alien products from batches, ensures ‘cleaner’ batch process. Totally enclosed with dust extraction of airborne dust particles. Sieve is angled to maintain a product flow, with helper bars within the machine to carry product to clean end outlet. The angles can be altered between a specified range. Cyclones for sieve aspiration system. Cast iron rotary valve unit for dust cyclone. Variable inlet and outlet options, depending on product, throughput and client specification.